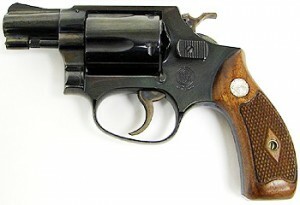 The Chiefs Special, which later came to be known as the Smith & Wesson Model 36 was not the first production .38 Special snubby; that honor goes to the Colt Detective Special in 1927. 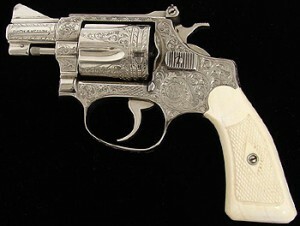 The Chiefs Special was the first 5-shot J-frame .38 Special revolver produced by Smith & Wesson. I would be willing to suggest that it is the most influential compact revolver design of the 20th Century. The Colt Detective Special is gone but not forgotten, as is the S&W Model 10 Military & Police snubnose, but the diminutive J-frame snubnose remains one of the most popular personal defense handguns in the world. In its essential notes, it is copied by Ruger, Taurus and Charter Arms. Whether or not we would declare it the archetypal snubby would come down a matter of personal taste, but the Chiefs Special is certainly the leading contender for that designation. The Chiefs Special J-frame was developed from the very popular .38/32 (.38 S&W) Terrier I-frame revolver. The I-frame was a 5-shot hand ejector double action revolver. It was very popular because it was so small and light, but it was not strong enough to handle the more powerful .38 Special round. The demand was great for a snubby that was small like the Terrier but able to handle the .38 Special. Smith & Wesson lengthened the cylinder and frame of the I-frame, and beefed it up a bit. They dubbed it the J-frame. It was introduced at the International Association of Chiefs of Police (IACP) conference held in Colorado Springs, Colorado, in October 1950. In a stroke of marketing genius, S&W named the gun the Chiefs Special and thus it has remained ever since. In 1957, S&W went to a number system for designating guns. The Military & Police became the Model 10. The Chiefs Special became the Model 36. The Terrier became the Model 32, and so on. This is why you get the curious pre-Model # designations. Most of the guns that got a model number had a pre-model number name. A pre-Model 36 is a Chiefs Special made before 1957. The Model 36 Chiefs Special was produced from 1950 to 1999. It still survives in modern metals in the form of the Model 637, the Model 60, the Model 36LS, the Model 340, the Model 360, and their variants. Contemporary J-frame S&W revolvers are actually built on the J-Magnum frame rather than the true J-frame. If you compare a current J-frame with an original Model 36 or 60, you will notice that the frame and cylinder are slightly longer on the new guns. They are all built to the length that will accommodate .357 Magnum, even the models that are chambered for .38 Special. All of the new stainless J-frames today are chambered for .357 Magnum rather than .38 Special. (There have been variants produced in the Model 60, 66, and 640 that are “re-issued” in .38 Special, so check the gun you’re looking at.) If you go to the store today to buy an all-stainless J-frame, if it is new, it will be chambered in .357 Magnum as will be the Model 360 and the Model 340. You can, of course, shoot .38 Special in the .357 Magnums, but Smith & Wesson finds it necessary to enable their new snubs to chamber .357 regardless of how painful they may be to shoot. The stainless and alloy Airweights are still chambered in .38 Special and rated for +p, and IMHO, they’re the best value and most utilitarian members of the class. The question of using modern +p ammunition in these old revolvers often comes up. While the all steel early models will probably stand up to a limited amount of +p, they were not designed to handle it. Loads like Speer 135g +p and Cor-Bon DPX did not exist when these guns were built. The safest course with the Model 36 is to stick with standard pressure loads if you choose to shoot it. +P absolutely should not be used in the early Airweights, the Model 37, 38 and 42. And, of course, the all aluminum “Aircrewman” revolvers should not be fired at all, even with standard pressure loads. The new Airweights, the Model 637-1, 638-2 and 642 are rated for +p and will handle it without damage to the gun. The Model 36 and its children have endured for half a century and the odds are good that they will be around for quite some time.